The mission of Ohio Central Bible College is to prepare individuals to grow spiritually by studying the Word of God (the Holy Bible) and to challenge them to be of service to others. OCBC is a place where students can learn more about the life and teachings of Jesus Christ (John 14:6). 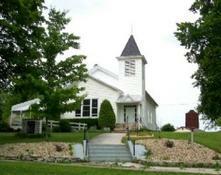 Ohio Central Bible College is Christian, independent, conservative and in the evangelical tradition. Our motto is "Seek ye first the Kingdom of God" (Matthew 6:33). 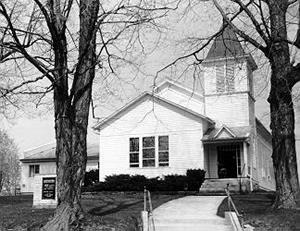 Founded in July 2009, Ohio Central Bible College holds classes, seminars, special events and a 1,000 volume Christian research library in the historic Iberia Presbyterian Church through the courtesy of the congregation. The church served as a chapel for two former 19th century institutions of higher learning. Iberia College (1854-1867) chose Rev. George Gordon, A.M. as its first president. An abolitionist and Presbyterian minister, Rev. 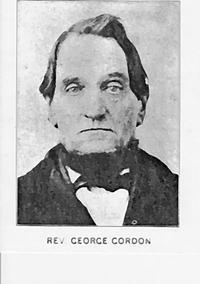 Gordon was convicted of violating the Fugitive Slave Law. He was pardoned by U.S. President Abraham Lincoln. Rev. Gordon died in 1868 and is buried at the Iberia Cemetery. Poet John Willis Menard and Dr. George T. Harding (B.A., 1860) were Iberia College alumni. During 1867 the institution, under new ownership, was renamed Ohio Central College. Its most famous student was Warren G. Harding (1865-1923), a Morrow County native and the 29th U.S. President. Harding graduated in 1882 with a B.Sc. and taught school north of Marion before entering the newspaper business, politics and public service. Ohio Central College eventually closed. 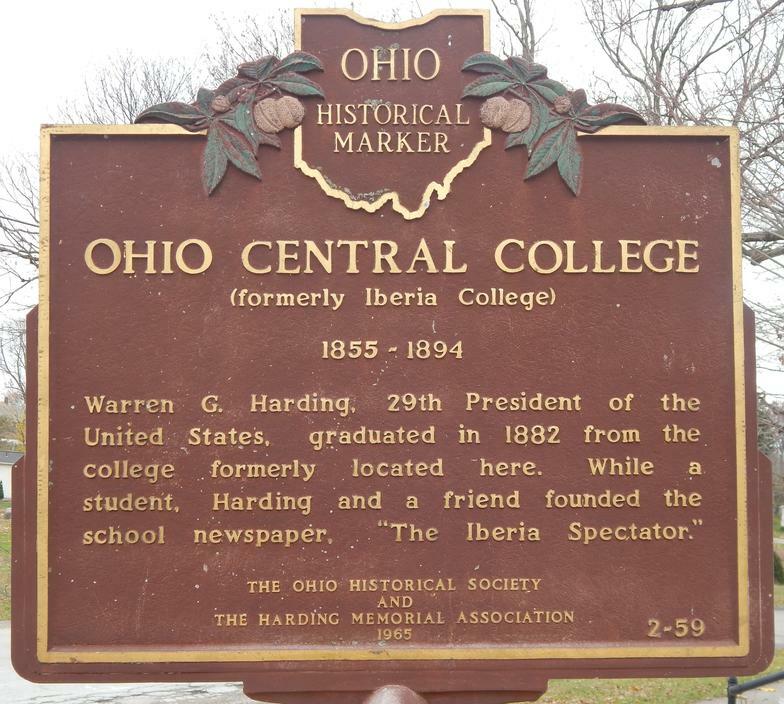 Ohio Central Bible College, founded in 2009, traces its heritage to the two 19th century Iberia colleges. The Ohio Historical Society named the former Ohio Central College as an important historical site in 1965. The Ohio Historical Marker is shown on the right and is located on the grounds of the Iberia Presbyterian Church. Reverend John Watson, M.Th., Columbus, Professor Emeritus and Academic Dean Emeritus, seminars. Reverend Dr. Dennis Schultz, D.Min., Mount Gilead, Dean of Faculty, OCBC 104 and seminars. Reverend Jack Moore, M.Div., Marion, Academic Dean, OCBC 101, 103, 108 and seminars. Professor Sam Meier, Ph.D., Columbus, seminars. ​Reverend Mark W. Phillips, D.D. (honoris causa), M.A., Mount Gilead, OCBC 102, 104, 107 and seminars. (Ohio Central Bible College president and founder). Reverend Rhett Crabtree, Th.M., Green Camp, OCBC 105, 106 and seminars (2019 OCBC Board of Trustees chairperson). GUEST LECTURERS: Mr. Bruce Edwards, Diploma in Bible Studies, Richwood, seminars; Rev. Dr. C. George Fry, Ph.D., D.Min., Circleville, seminars; Mr. Charles Howland, J.D., M.A., Mount Gilead, seminars; and Rev. Dr. Gary Staats, Th.D., Ph.D., Findlay, seminars.